Laughter, lively music, and delicious food from around the world fill St. Anthony Avenue in St. Paul, Minnesota as a crowd whoops it up at the Better Bridges Bash. “We’re seeing that this community is engaged in how the streets feel, and they are letting local leaders know what they want,” offers Isaak Rooble, who is standing next to a gallery of photos showing possible improvement projects for this diverse community. People stick green post-its to ones they like; pink ones to those they don’t; and yellow for maybe. At another tent, people are invited to share their own desires and ideas for improving their neighborhood, with suggestions including "fewer cars" and "more street parties." 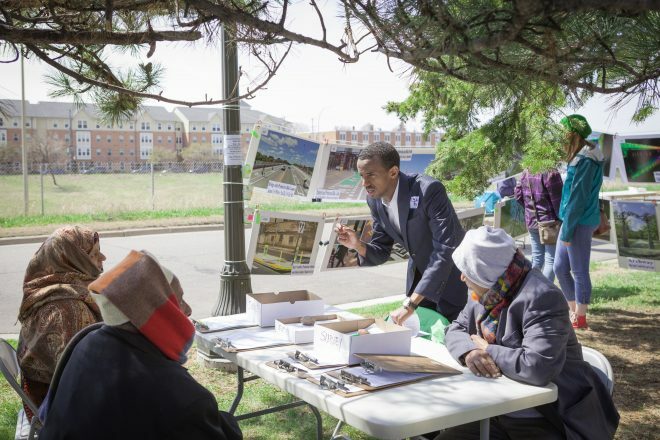 As part of their "community-led mission," the organization hosting the event, Friendly Streets Initiative (FSI), is conducting surveys with as many people as possible in English, Somali, and Oromo (a language spoken in parts of Ethiopia and Kenya) to learn more about issues in the neighborhoods surrounding the freeway. The most popular ideas became the nucleus of the Charles Avenue Friendly Street plan, which emphasized four street improvements: (1) Better-marked crosswalks at busy intersections; (2) Traffic circles, which help slow the speed of vehicles at low-volume intersections; (3) Medians and other modifications at busy intersections, which provide refuge for pedestrians and bicyclists crossing the street; (4) A raised intersection, and sidewalks bumping out into the streets at select locations. 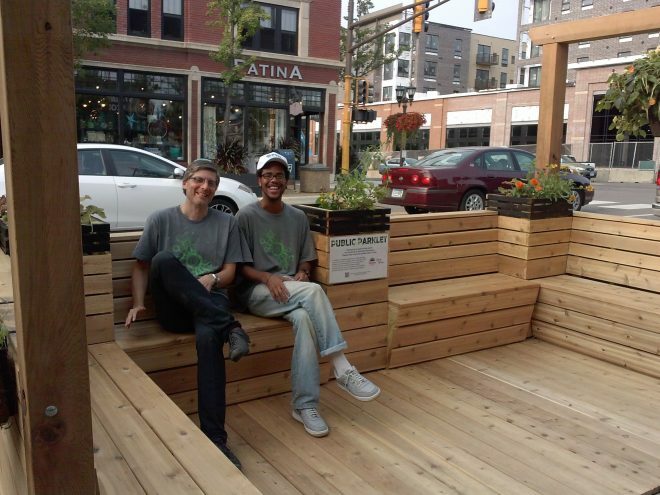 The volunteer committee formally organized themselves as the Friendly Streets Initiative to build support for the Charles Avenue project among neighbors and on the city council, and construction on Charles Avenue began in 2014 along a four-mile stretch of the street. “FSI built grassroots support for change in St. Paul, a city reputed to have lots of opposition to bike and walk projects,” observed Jessica Treat, director of Transit for Livable Communities in an interview earlier this year. Since then TLC has become FSI’s fiscal sponsor. Treat credits FSI with mobilizing young families and other groups in the city who don’t usually weigh in on planning decisions, which showed political leaders the depth of public support for walk and bike projects. Here are the chief lessons of Friendly Streets Success, which can be applied in other communities around the country. Take art seriously. Art is not a frill—it’s indispensible in helping everyone reimagine their communities, and discovering new approaches to old problems. 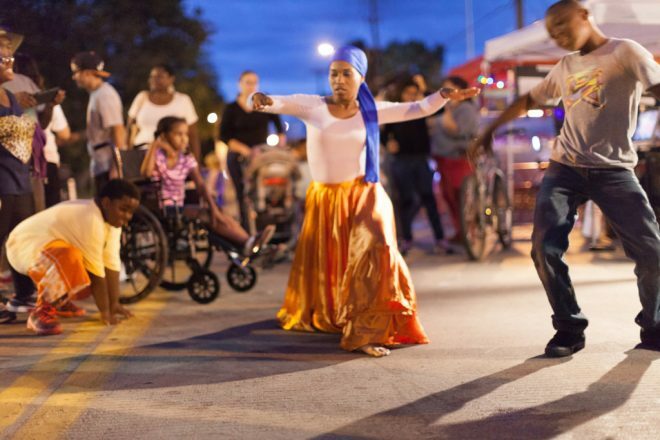 “Asking people to draw or paint or act out what they would like to see in their neighborhood allows everyone to think differently and find new inspiration,” notes Robyn Hendrix, arts organizer for the Friendly Streets Initiative (FSI) from 2014 to 2016. “The arts activities brought kids and families out, and created a festival quality that also drew more low-income people and people of color,” adds FSI director Lars Christiansen. Make it fun. “A feeling of festivity, levity and wonder enliven the conversations about public spaces,” concludes Christiansen. “You need a sense of play in everything you do.” FSI events have included mini-golf, living statues, chalk drawing, flagmaking and lots of music and food. ** This is an excerpt from Jay Walljasper’s new book, America’s Walking Renaissance, which can be downloaded as a free PDF here.